In 2004 researchers studied the blue zones around the world where there were the most centenarians. Okinawa is one of those places. How do people live to 100? Well there are many factors but one is the notion of hara hachi bu. 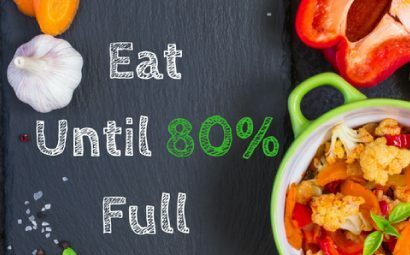 Which translates to eat until you are 80% full. Eat slowly- chew, put your fork down, take a sip of water, eat with your left hand. It takes 15-20 min for our satiety mechanisms in the brain to catch up. So if you are eating your lunch in 5 min….your body doesn’t know it’s full. I have many clients that say they don’t recognize fullness. I recommend trying to eat to 80% ; eat a little less- leave some food for tomorrow or another meal. Can you try this at least once a day? Eat without distraction- Can you dim the lights and eat with family? Can you move away from your desk or computer? Try it! How does the food taste, smell? Check in to see how you are feeling. Eat until you are no longer hungry. NOTICE how you feel (eating less). And NAME how you feel. When I first did this exercise in my Precision Nutrition class. I found that it was challenging because I wanted more! I wrote about how I struggled with this concept and it helped me work through it. The more I practiced (eating just a little less and until I was no longer hungry instead of to fullness the better I got until it became habit! Use a smaller plate or container. IF you go to the salad bar use the smaller container. Use your smaller plates at home.